The Kerrie Show: When is a Child Old Enough to Be Responsible for a Pet? When is a Child Old Enough to Be Responsible for a Pet? Having pets around the house is a great way to introduce your kids to animals, and how to love and care for them, at an early age. Having a family pet is a good place to start, but at some point, they will probably show interest in having their ‘own’ pet. Sites such as petsarethebest.net talk about the great reasons that pets in the home are good for your kids. But, when are your kids old enough to be responsible for them? At such a young age, your kids will still be learning about themselves, let alone taking care of another. At this age, you should make sure your family pet is introduced calmly to the children. You should not leave your pets and young children together unattended, as it is very easy for them to hurt each other by mistake, under the pretense of ‘playing’. It is important they build a positive relationship with each other and you can begin teaching your child about how pets need taking care of. If you already have a dog and are expecting a baby, you should also take care when introducing the baby. Dogs can get jealous too, so it’s important to make sure your dog does not feel pushed out by the new baby. Even the most gentle, loving animals, can become unpredictable when excited or jealous. At this age, you can start getting your kids more involved with taking care of your pets. Do not expect them to take full responsibility for an animal, but letting them help you with certain tasks is a good way to start. Every child matures differently, but at around six-years-old, you can begin assigning small tasks. You should still be present, but let your child feel like this is their task. Feeding the pet at a certain time every day can help them to establish a positive routine and a feeling of responsibility. 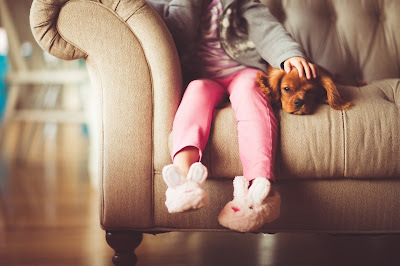 Gentle encouragement and reminders can reinforce your child’s positive attitude towards taking care of your pet and help them develop empathy towards animals. By this point, you can give your kids small tasks to take care of, but keep in mind that you are the one responsible for the pet’s wellbeing. You can incorporate tasks into the daily routine, such as giving the dog dinner before your child sits down for dinner. This can work well as a reminder and mean you have the option to reinforce the importance of the task. If your child does not give the dog dinner, then your child misses out too. If your child is hungry, they can empathize with your pet, who will also be hungry. You can help them to understand things from the pet’s perspective, and how we must take care of our pets as they cannot take care of themselves. The type of pet you choose will also come with different levels of difficulty. A small pet such as a goldfish, gerbil or guinea pig is a good option for a child that wants their ‘own’ pet. Whereas a puppy that requires training and walks will deliver different challenges. Whichever type of animal you have or choose, supervision is always important, to ensure your child and your pet’s safety. Your child and your pet will develop their own bond and an animal around the house is a great way to promote positivity towards animals. Check out this piece on reasons for annoying puppy noises and how to deal with them!